Sibelius was himself a violinist, and his understanding of the instrument is one of his greatest strengths as a composer. It constantly shows in the symphonies and other orchestral works, of course, and as one might expect it is uppermost in the qualities of the music collected in this interesting programme. Given that his output of solo-orchestra music is relatively small, and can be contained on a single CD, albeit generously filled, it is surprising that the programme is not more common. In fact it makes sense and is one of the chief attractions of this issue which couples a good performance of the Violin Concerto from the 1980s with interesting recent performances of the less celebrated music. Miriam Fried and the Helsinki Philharmonic recorded the Violin Concerto for Finlandia in 1988. She was already an experienced soloist, having won the Queen Elisabeth Competition in Brussels back in 1971. Soon after that she released her first recording of the Sibelius Concerto (on DGG), which was warmly received. But this second version is probably better still, remarkably assured in technique and captured in a sensitive and atmospherically balanced recording. Okko Kamu confirms his Sibelian credentials with perfectly paced tempi, always at one with his soloist. Fried is not afraid to wring the utmost emotion from the music, as when she pulls back the tempo in the more expressive moments of the first movement. Not everyone will like this, but I find it characterful and compelling. The slow movement is eloquently drawn, though her sound has not quite the purity of tone of some others, such as Kyung-Wha-Chung (Decca) or Cho Liang Lin (Sony). The finale is taken at a relatively sedate pace, and therefore lacks the sheer exhilaration that this music can bring. Instead the sonorities are rich and rewarding; this is a matter of interpretation and judgement, and there is more than one answer to the interpretative problems. Fried's is perfectly acceptable, if not as exciting as it might be. In all, a compelling and rewarding performance. The same can also be said for Kavakos in the Humoresques. 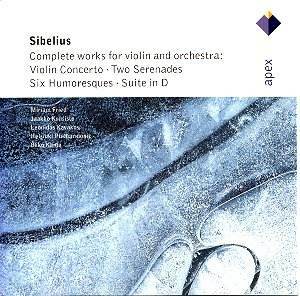 These fine pieces are not as well known as they might be, and this violinist knows and loves his Sibelius, as his remarkable performances of both versions (early and revised) of the Violin Concerto (BIS) has already shown us. The Tapiola Sinfonietta too has excellent credentials and make the ideal partners. The slighter items, the Suite and the two Serenades, are idiomatically performed, but they are adequate rather than inspired, both as performances and as music. The Suite (1929, so the notes tell us) comes very late in the composer's output, but it is not especially inspired. Nor, once again, is the layout and design of the Apex booklet. Why leave one of the four pages completely blank when the print is so small?